As I travel country roads and stroll around many gardens, including my own, I see members of the Rudbeckia family blooming everywhere. Almost 4 weeks ahead in the season, I wonder what other flowers are going to give me the fall colour I need that it does. Gloriosa Daisy, Yellow Coneflower, Black-eyed Susan and Rudbeckia are the many names people are calling this fabulous plant. The Rudbeckia family is a diverse one, but one characteristic they all have in common is their striking yellow flowers. With annual flowers looking worn out and the majority of summer-blooming perennial flowers finished their blooming, Rudbeckia is a wonderful sight. Blooming usually starts later in the season, mostly seen blooming mid- to late-August. The variance is nearly unbelievable; short or tall varieties, small or large flowers, two-tone flower colours, and they are single- or double-petalled. Even the foliage is different on various varieties. With these differences, plantings of Rudbeckia are a welcome addition to any garden. One plant will give a small area a lift, or if mass planted it really makes a statement. I have seen a mass-planting in the early evening give a golden haze over the yard, and what a view it was. That sight gave me the inspiration to plant more into my own garden. Rudbeckia is terribly easy to grow from seed. 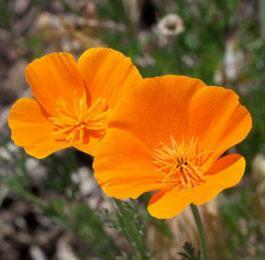 Simply allow the plants to go to seed in the garden, or sow seeds 1.4 inch deep in a moist, soilless mix. The narrow leaves of the plant are dark green and rough to touch, and therefore easy to identify when transplanting to another area of the garden. 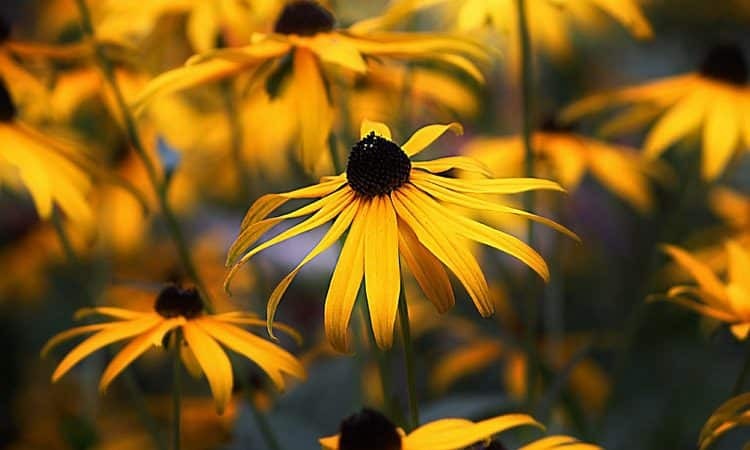 Rudbeckia require full sun and moist soil to perform their best. They can be planted in a part-shade area, but will reach for the sun. 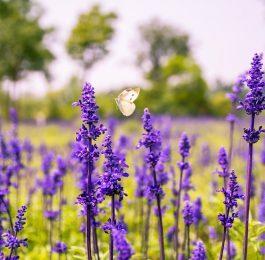 If planted in drier soil, be sure to provide them with adequate water weekly, otherwise they will give small, distorted flowers and are short lived. Rudbeckia is also highly useful as a cut flower, as it holds its colour and shape for several weeks. Simply immerse the cut stem into boiling water for a few seconds then use either in an arrangement or for cut flowers. Goldstrum – Thin, single-petalled, bright golden-yellow blossoms with a brown center, carried on 2 foot tall plant, with dark green, narrow leaves that are rough to the touch. Irish Eyes – Single-petalled, bright yellow blossoms feature a lime-green center. Unique blossoms to look at on their 3 foot tall stems. Medium green leaves are wider than Goldstrum and not as hairy. Lanceleaf Rudbeckia – Double-petalled, bright lemon-yellow blossoms resembling pompoms grace the top of this very tall plant. One stem will produce side-branches, giving the gardener 8 to 10 blossoms. Reaching a height of 7 feet or more, it is a fabulous plant to place at the back of the border. 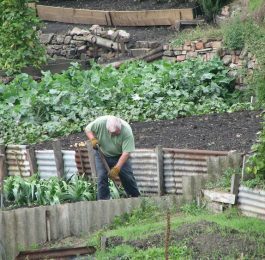 It does require space for its expanding width as well, as it doubles in size every year. As its name suggests, its leaves are deeply cut, large, smooth and medium green in colour. Gloriosa Daisy – Perennials and annual species, this beauty is worth it in any garden. The flowers have a brown eye, with petals starting at the center in a burgundy-brown that transform to a golden-yellow edge. The blossoms can reach up to 6 inches across and are quite a sight, rising above their dark green, narrow leaves. Different plant cultivars can be 10 inches to 2 feet tall. Toto – An annual variety with round, single petals and a brown center. It grows 3 to 4 feet tall and stays narrow in growth with its medium green leaves. Goldquelle – A wonderful perennial for partial shade and wet areas. This plant has bright yellow, semi-double flowers with yellow centers and deeply-cut leaves. This plant matures to a height of 1.5 to 2 feet tall. Maxima – An interesting plant, as its golden petals tall downwards to show its tall, dark brown, slightly pointed center. Growing 4 to 5 feet tall, it has very long stems that are great for arrangements. It is a tender perennial in Zone 5 and therefore needs a sheltered spot to pull through the winter. Sonora – The striking contrast is why this annual is so popular. This plant sports a very dark brown, seemingly black flat eye. It is surrounded by dark brown flower petals, with a small rim of bright gold at the very edge. Standing 2 to 3 feet tall with its dark green leaves, it is a real eye-catcher. To give a twist to the regular yellow that we think of, another plant sporting the Rudbeckia name is Rudbeckia Purpurea, or Purple Coneflower as it is commonly called. It also is in bloom now, grows 3 to 4 feet tall and has rose to light purple blossoms. There is a creamy- or off-white variety, called Alba, which has a slightly golden brown center. There are varieties of Rudbeckia suitable for everyone and every garden; growing in wet to dry areas, providing height and brightness everywhere.